Obituary – Schump, Beryl (Harbaugh) « Perry High School Alumni Association, Inc.
Short Story club – ’21; Peroma – ’21; Tennis ’20; Glee Club – ’20-’21. Schump, Beryl H., 92, retired Herington High School Spanish teacher, died Saturday, Nov. 23, 1996. She was born September 14, 1904 in Oklahoma to Charles and Lulu Harbaugh. 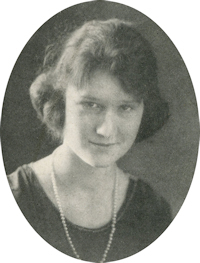 She graduated from Perry High School in 1921 and Oklahoma University in 1928. Before her marriage to William M. Schump March 6, 1928 in Enid, OK she taught school at Arkansas City, KS. They made their home in Herington, KS. Vigil 7 p.m. today, Brockmeier Funeral Home, service 10:30 a.m. Tuesday, St. John’s Catholic Church, Herington. Survivor: son, William of Topeka. Memorial has been established with St. John’s Catholic Church. Her husband, William, preceded her in death.